The odontoid process (also dens or odontoid peg) is a protuberance (process or projection) of the Axis (second cervical vertebra). It exhibits a slight constriction or neck, where it joins the main body of the vertebra. On its anterior surface is an oval or nearly circular facet for articulation with that on the anterior arch of the atlas. On the back of the neck, and frequently extending on to its lateral surfaces, is a shallow groove for the Transverse ligament of the atlas which retains the process in position. 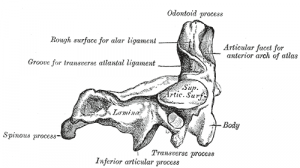 The apex is pointed, and gives attachment to the Apical ligament; below the apex the process is somewhat enlarged, and presents on either side a rough impression for the attachment of the Alar ligaments; these ligaments connect the process to the occipital bone. 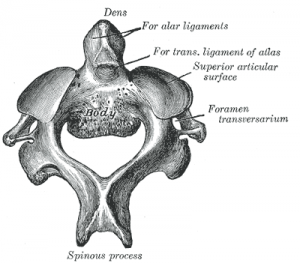 Type I Fracture - Extends through the tip of the dens. This type is usually stable. Type II Fracture - Extends through the base of the dens. It is the most commonly encountered fracture for this region of the axis. This type is unstable and has a high rate of non-union. 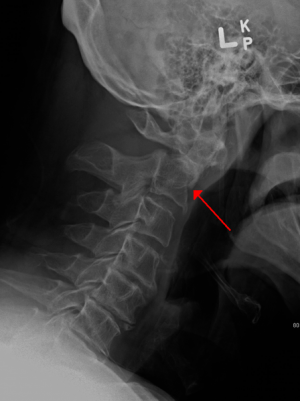 Type III Fracture - Extends through the vertebral body of the axis. This type can be stable or unstable and may require surgery. Transverse ligament rupture may occur in patients with type II fracture. Submandibular approach for single-stage craniovertebral junction ventral decompression and stabilization: a preliminary cadaveric study of technical feasibility. ↑ Grauer JN, Shafi B, Hilibrand AS, Harrop JS, Kwon BK, Beiner JM, Albert TJ, Fehlings MG, Vaccaro AR. Proposal of a modified, treatment-oriented classification of odontoid fractures. Spine J. 2005 Mar-Apr;5(2):123-9. 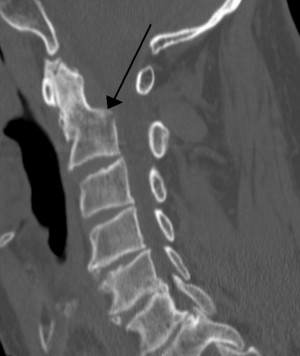 ↑ Debernardi A, D'Aliberti G, Talamonti G, Villa F, Piparo M, Cenzato M. Traumatic (type II) odontoid fracture with transverse atlantal ligament injury: a controversial event. World Neurosurg. 2013 May-Jun;79(5-6):779-83. doi: 10.1016/j.wneu.2012.01.055. Epub 2012 Jan 31.